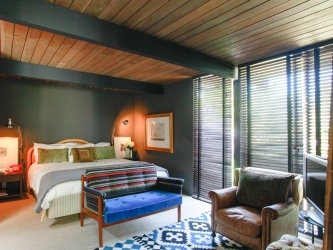 Due to the post-and-beam construction of Eichler homes, the architectural design of Eichlers permitted extensive use of floor-to-ceiling windows throught the entire home. This liberal use of glass throughout the home is one of the main features of Eichlers that owners and homebuyers enjoy the most. For most owners of Joseph Eichler Homes, the preference is to leave the windows completely uncovered with the exception of sleeping areas or other areas of the home requiring additional shade or privacy. Eichler window treatment pictures are provided below to give fellow Eichler owners ideas for their window projects. If you have recently installed window treatments & coverings in your Eichler or mid-century modern home and would like to share them with others, please e-mail them to Team@EichlerForSale.com. 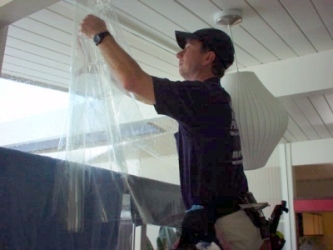 While protective or safety film for windows is typically not the first thing that comes to mind when thinking about window coverings, the use of these films is very popular with Eichler owners. 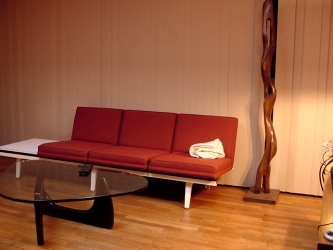 Their use in Eichler homes is common because it permits a generous amount of sunlight into the home while reducing UV-rays which can fade furniture, flooring, and other items in the home. 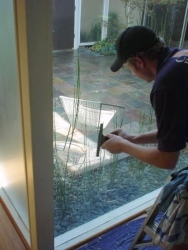 Additionally, thicker window films can add an element of safety by providing protection against breakage of the single-pane glass found in most Eichlers. The photo above shows the installation of a clear, 4mm safety film on a great Eichler window (seamless installation). 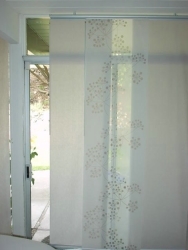 A wonderful alternative to pole or cord mounted curtains and blinds, sliding shoji screen panels can add a simple yet sophisticated look to any Eichler or mid-century modern home. These timeless slider panels are also convenient in that they can easily be adjusted on wall or ceiling mounted tracking system to allow for as much light (or privacy) as desired. 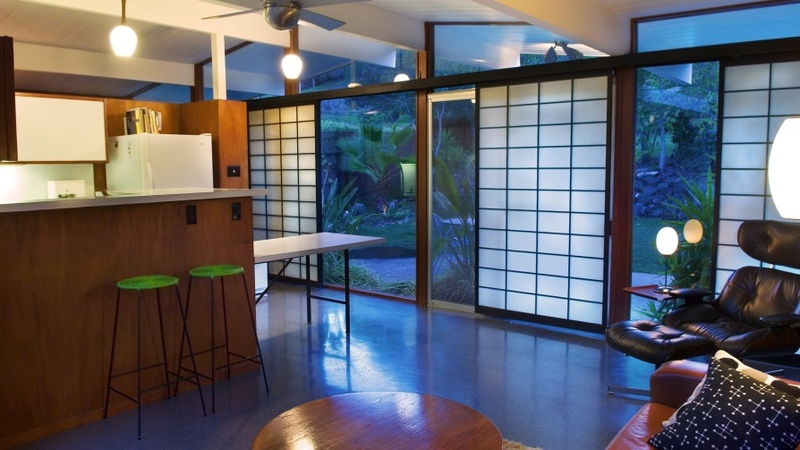 Similar in design to a sliding Japanese Shoji screen, window or curtain panels can easily be installed on an easy-to-mount, tracking panel which blends easily into an Eichler home. Window and curtain panels come in a variety of styles and thicknesses, from a full range of privacy to open weave designs. Price points for panels can vary greatly from inexpensive designs found at Ikea to very high-end window panels available thru speciality window treatment shops. Window blinds can serve as a clean-lined, contemporary alternative to curtains in an Eichler or other mid-century modern home. There are many styles of blinds to choose from and owners should take proper care to properly size blinds prior to purchase since many "off the shelf" blinds are not tall or wide enough to accomodate the large windows found in Eichlers and other midcentury modern homes. While typically found in modern commercial buildings, a number of manufacturers have designed motorized window treatment solutions which can also work well in residential applications. These automated window treatments range from basic, remote control shade or blind systems to more sophisticated, 'sun-sensing' systems which will automatically raise and lower the blinds or shades based on the position and intensity of the sun. Many of the newer systems designed for residential use are very low-profile, quiet and easy-to-operate. Two of the leading manufacturers of automated window treatment solutions are Lutron (manufacturer of the Sivoia QED™ line of controllable shading products) and Mechoshade.